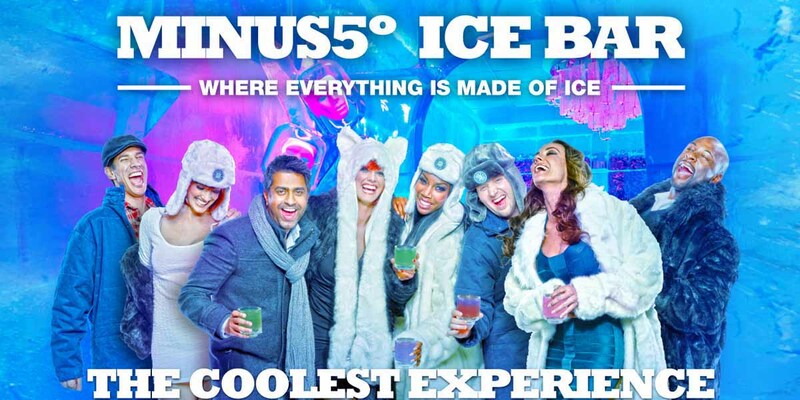 Minus5 Ice Bar Experience is the coolest experience in town where everything is made of ice! The Minus5 Ice Bar Experience is considered the coolest attraction in Las Vegas. How can we say that? Well, quite literally, everything here is made of ice. Don’t be surprised if you find yourself marveling at the ice chandeliers after a few drinks. Those drinks, by the way, are served in glasses that are made of, you guessed it… ice. Somehow the vibe doesn’t get chilly in here though. With jamming music and an LED light show that even makes the ice walls come alive, the party heats up…even in such freezing temperatures. With locations in New York and Orlando, crowds flock to the Minus5 Ice Bar Experience over and over again. New ice sculptures are made all the time, along with an innovative drink menu that keeps the place fresh. There’s a couple of ways to have a Minus5 Ice Bar Experience depending on the package you choose. With either selection you’ll be outfitted with a warm parka or a fur coat that keeps you nice and cozy. You’ll also be given gloves to keep your fingers from sticking to your drink. There are a ton of bars and party spots in Las Vegas but it is safe to say that there is no other place quite like Minus5. Imagine being transported to the chicest igloo on the planet, kind of like when Superman goes to his Fortress of Solitude and gets recharged in his other worldly land of ice. But now add a bar and you’ve got yourself an architectural creation that you can really say is like nothing else out there.